Every society has certain taboos – cultural/religious, social, and political – set apart and designated as restricted or forbidden to associate with, or even to bring in ordinary discussion. The Rohingya issue (for some strange reasons) seems to be such a taboo in Bangladesh. Both people and government here don’t want to go beyond certain limits to have a candid discussion on the crux of the Rohingya issue, which goes beyond the subject of organized persecution and killing of Rohingyas in Myanmar. Meanwhile, the Bangladesh Government has taken two absurd decisions: firstly, it has virtually refused to grant refugee status to the Rohingyas on the flimsy ground of “over-population”; and secondly, it has proposed to “settle” Rohingya refugees at Thengar Char, a remote, marshy, and uninhabitable island, more than 37 miles from the mainland of Bangladesh, which is often submerged in water. “This is a terrible and crazy idea … it would be like sending thousands of people to exile rather than calling it relocation,” a Bangladeshi government official told CNN recently, and he didn’t want to be named because he feared reprisals. Arakan was a Bengali-speaking Muslim kingdom up to 1784, when Buddhist Barmans annexed the kingdom to what is Myanmar today. The British occupied Myanmar or Burma in 1826 and ruled the country up to 1948. 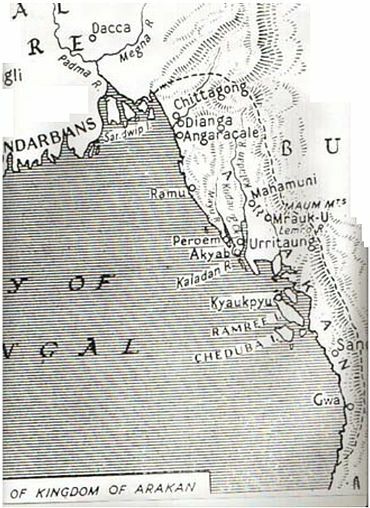 When the British left, Arakan, also called Rakhaine, remained a part of Myanmar. Meanwhile, thanks to Myanmar government policy, Buddhist/Barman people had outnumbered the indigenous Bengali Rohingyas in Arakan. After 1948, Arakanese Muslims (Bengalis who speak Chittagonian dialect) tried to become independent, in vain. The rest is history. To conclude, Bangladesh just can’t afford to be a passive spectator of the ongoing persecution of the Rohingyas who are indigenous to Arakan, once integral to Bangladesh. Now, there are some open-ended, —- and possibly embarrassing – questions in this regard. If Bangladesh should assert its claim on Arakan is altogether a different and difficult question! If there is a military solution to the problem, is indeed an embarrassing question for Bangladesh.